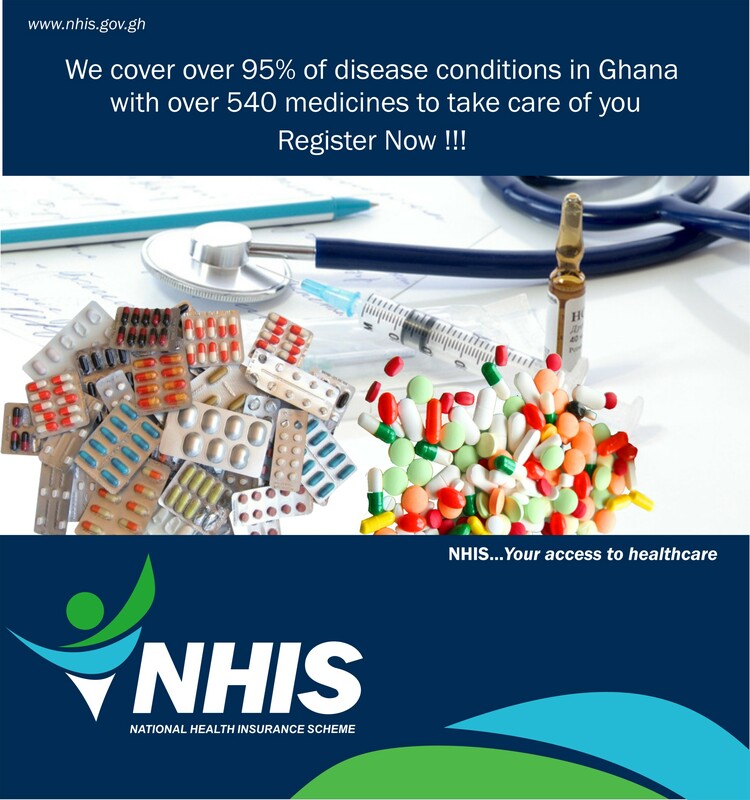 Over 95% of disease conditions that afflict us are covered by the NHIS. ultrasound scans for general and specialist out-patient services. HIV/AIDS symptomatic treatment for opportunistic infections. Out-patient/day surgical operations, including hernia repairs, incision and drainage of abscesses, and excision of lumps and haemorrhoidectomy. Medication, namely, prescription medicines on the National Health Insurance Scheme Medicines List, traditional medicines approved by the Food and Drugs Board and prescribed by accredited medical and traditional medicine practitioners. Any other services approved by the Minister of Health. General and specialist in-patient care. Investigations including laboratory investigations, x-rays and ultrasound scans for in-patient care. Cervical and breast cancer treatment. Surgical operations, including appendicectomy (removal of the appendix). Medication, namely, prescription medicines on the National Health Insurance Scheme Medicines List, traditional medicines approved by the Food and Drugs Board and prescribed by accredited medical and traditional medicines practitioners. (Processing for) blood and blood products. drainage, tooth extraction and temporary relief. Keratometry (measuring the curvature of the anterior surface of the cornea). Medical emergencies and surgical emergencies, including brain surgery or heart surgery due to accidents. Obstetric and Gynaecological emergencies including Caesarean sections. Appliances and prosthesis including optical aids, hearing aids, orthopaedic aids and dentures. Cosmetic surgeries and aesthetic treatment. However, reconstructive surgery, such as is performed on burns patients, is covered. Assisted reproduction, e.g. artificial insemination and gynaecological hormone replacement therapy. Echocardiography (a painless test that uses sound waves to create moving pictures of the heart to give information about the size and shape of the heart and how well it is working). Photography (photographs taken in clinics/hospitals to give visual records of patients' condition and operations to track progress of treatment for medical files of the patient). Angiography (a procedure where a dye is injected into the blood vessels and a photograph of the vessel is taken). Orthoptics (diagnosis and treatment of defective eye movements and coordination). Dialysis for chronic kidney failure. Heart and brain surgery other than those resulting from accidents. Cancer treatment other than cervical and breast cancer. Medicines that are not on the NHIS Medicines List. Medical examinations for purposes of employment, school admissions, visa applications, driving license etc.